Tell us about Stand Up for Our Seas, and your role in the campaign? So, Stand Up for Our Seas is our campaign for this year, which is based around our expedition in the Maldives. It’s a coming together of passionate people and organisations to inspire and bring a message of positivity around plastic pollution. Its myself and Dr Claire Petros, who is also a veterinary surgeon and we’re teaming up with two wonderful Maldivian women and Coco Collection who are also passionate about ocean conservation. The campaigns main aim is to look at how we can inspire future generations to protect wildlife through a connection to nature and through an understanding of the challenges they face. What is the most important thing you have learnt? The most important thing I learnt throughout my expeditions was the needs for us to find a personal connect to nature as a way to develop our desire to protect it. There is a well-known phrase, ‘people protect what they love’, which is completely true however they only love what they know. So I came to realise that if we want to stand a chance to protect our planet as a whole, each and every person needs to find his or her own way to connect with their nurture desire to protect it. What’s the worst impacts of plastic and ocean pollution you have seen on wildlife? A couple of year’s ago during an expedition, I came across a beautiful big beast cow chewing on a piece of fishing net on a beach. I basically watched this animal that I’ve trained to protect in danger from something that we had created- it suddenly struck me that it wasn’t just animals in the ocean but on land too that were suffering from this predicament. She did eventually let go of the net and I managed to shoo her away. I would say that it is probably assuming that other people get it the same way that I do- it’s difficult to say without sounding arrogant because that is definitely not my intention, its more that I live my life in this bubble surrounded by like-minded people that deal with this everyday and really care about the planet and the environment. So I think one of the biggest mistakes that all of us in these environmental campaigns can make is assume that everyone thinks like that. Where did your passion for stand-up paddleboarding come from? I moved down to Devon after I graduated University and I had to have a hip operation, which left me quite physically inactive, A friend recommended paddleboarding and all of a sudden there was a sport that I could do. It also allowed me to explore and fall in love with the ocean all over again; and the more I explored the ocean the more plastic I started to see. Was that what sparked the idea for Paddle Against Plastic your organisation? 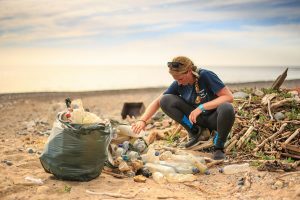 Yes, so I started Paddle Against Plastic in 2016, I saw the stats and there were 38.5 million plastic bottles used in the UK everyday, which is ridiculous. So I really wanted to start making a change by delivering a positive message of community and collaboration because that is the best way to engage people. The most used item that I was finding in my explorations was single use plastic water bottles. So I wanted to convey to people that this is the most common thing we are finding but the solution is so easy- if we each commit to having a reusable bottle- this is the single most empowering way we can all be apart of reducing our plastic footprint. What’s the best and worst response you have had doing Stand Up for Our Seas? The campaign is only just beginning so most people we have spoken to have had a positive reaction, especially in the Maldives where there is so much amazing awareness. The worst response is probably on social media where people have said that you shouldn’t be focusing on stopping the use of plastic but rather improving recycling. But that’s not the case because not everything we put in our recycling bins gets recycled because there just aren’t the facilities for it. My hope is that people feel empowered to do something themselves, so if you are stand up paddleboarders you can go and do your own litter picks on rivers. I think the most important thing is to care and help understand how our actions on land are affecting what’s going on at sea. So it’s not about feeling guilty for what we don’t do but about feeling proud abut what we can do. The post Meet the woman who is fighting back against ocean pollution appeared first on Marie Claire.